As happened last month, I didn’t manage to compile a new list of goodies until the first day of the next one. Here are a few recent finds and some older goodies that are pretty enough to be posted! These bags made in England come in delicious colors and sizes and can be carried by just about anyone; boys and girls. I favor The Metallic and The Flouro, but one could never go wrong with The Classic. What’s really fun is the monogrammed embossing that can only be done if purchased from the website in the U.K.
2. Swedish Hasbeens and Ugglebo. I’ve been a fan of clogs since my first pair in the seventies. In the Fall, my girls fell in love with a pair of bright pink patent leather Dansko’s. The price tag was steep, but the sight of them marching around was enough for me to hand over the card and relive my own childhood clunking. 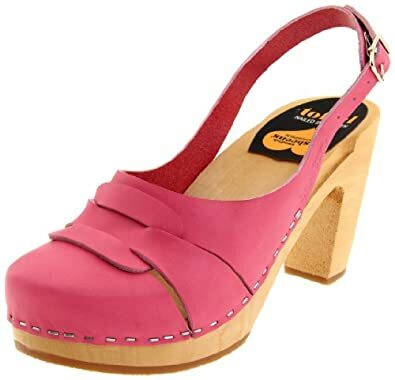 I wonder if my kids will remember their first clogs, the way I remember mine. I’m thinking a pair for me should be added to the Spring shopping wish list. Here are a few ideas. Ugglebo made for Hannah Anderson. They also come in metallic silver that can go with most of my mommy clothes, but I think the yellow could act as a neutral too. 3. Karen Walker is a designer from New Zealand who makes a really fantastic women’s collection. I love good fabric and great prints and could see myself in just about any of her day dresses. I’m currently coveting her houndstooth, which is bigger and zig-zaggier than an old school men’s traditional one. Her sunglasses are fantastic, too; whimsical and weird. Love her stuff! Karen Walker Oversized Tee Blue Houndstooth. Her navy is brilliant too. 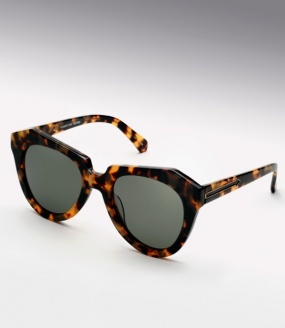 Karen Walker Patsy Sunglasses; these sold at Saks. About twice a year I get an urge to sew. This results in a visit to one of my favorite fabric stores where I touch everything and load up while letting my imagination fly free. 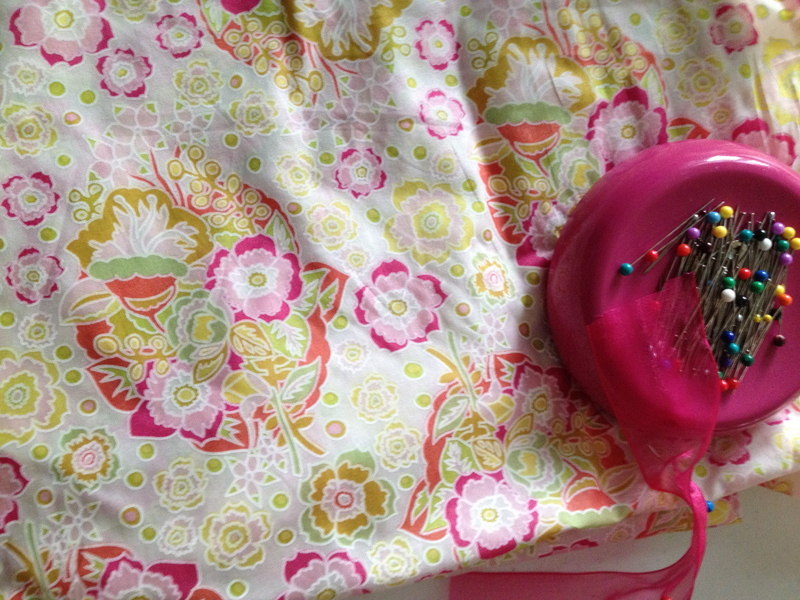 The problem is that there is never enough time to make all that I dream, not to mention my sewing machine tends to go on strike three-fourths of the way through any given project. Aunt Nor’s unfinished Thanksgiving apron is proof (she still wore it, since it was made with love). Even so, I continue to collect and fold my neatly stacked finds in the sewing room for when the bell tolls. 4. 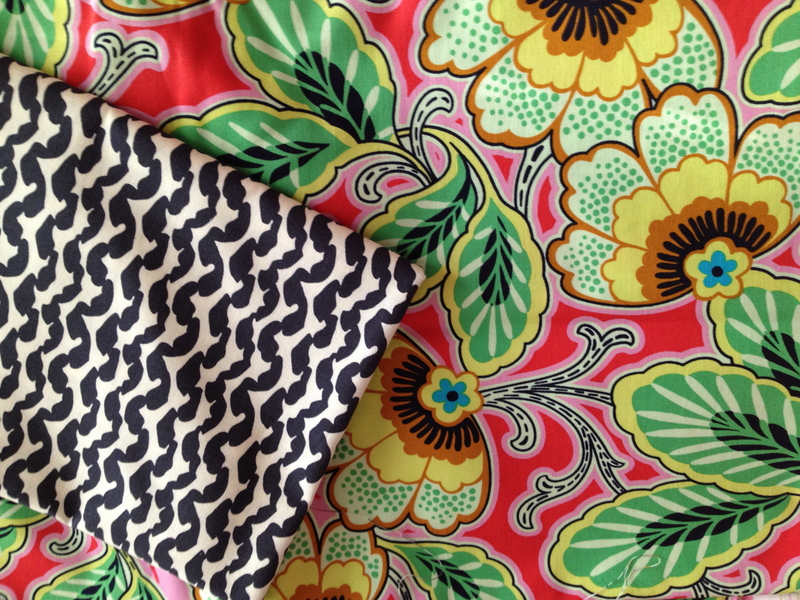 Two of my favorites fabric designers are Anna Maria Horner and Amy Butler. Technically these are quilting fabrics, but they really could be made into just about anything ready to wear. Anna Maria Horner Voile. Gorgeous, airy and soft. Would make great pajamas! Amy Butler. I bought this thinking I'd use it to make a tunic for myself, but now I don't know. A short shift for Summer that could be worn alone or with jeans? I couldn’t wrap up a goodies list without something running gear related. A like minded blogger over at Poppy’s Style did a great review of these Adidas tights. I’ve been thinking about them ever since. The pink Zebra colorway. Crazy, right? In an effort to lighten things up, I’ve decided that it might be a good idea to update my “Gear Goodies” post once a month. Let’s be honest, if I continued to write about cancer day after day, I’d be living in Debbie Downerland! Here are my “Gear Goodies” for December! The owner of a company called, “Bic Bands,” also has a WordPress blog called, A Mom On the Run. A few other bloggers had mentioned Bic Bands; cute headbands that don’t fall off or leave a running gal with a massive headache. I checked out the website and placed an order for two. My skinny gold sparkle and skinny zebra print arrived within a few days, and I wore one during yesterday’s six miler. I am happy to report that my hair stayed back and I didn’t have to hit the Advil due to brain squeeze. Love! A few weeks ago I tried Swiftwick socks. I bought them at Raleigh Running Outifitters based on a review by one of the female employees. There’s nothing fancy about Swiftwick. They are low, white, with the size (M) in black on the foot. I didn’t have great expectations (I fall for gimmicks too easily and these are so plain), but wow, they are terrific! The toe is a bit cushioned and the sock is made of a dry weave fabric, but they don’t feel synthetic. They also washed great. As a side note, I was excited to see that Runningskirts.com’s adorable heart compression knee socks are made by Swiftwick. I’m hoping those arrive at my front door soon. I mentioned in last weekends’ post that I ran into Lululemon to check out the new stock in Paris Pink. I have been waiting for LLL to release some pink gear; everything has been purple, purple, purple for far too long. The Paris Pink color is gorgeous and bright. Unfortunately, I hated everything on me. 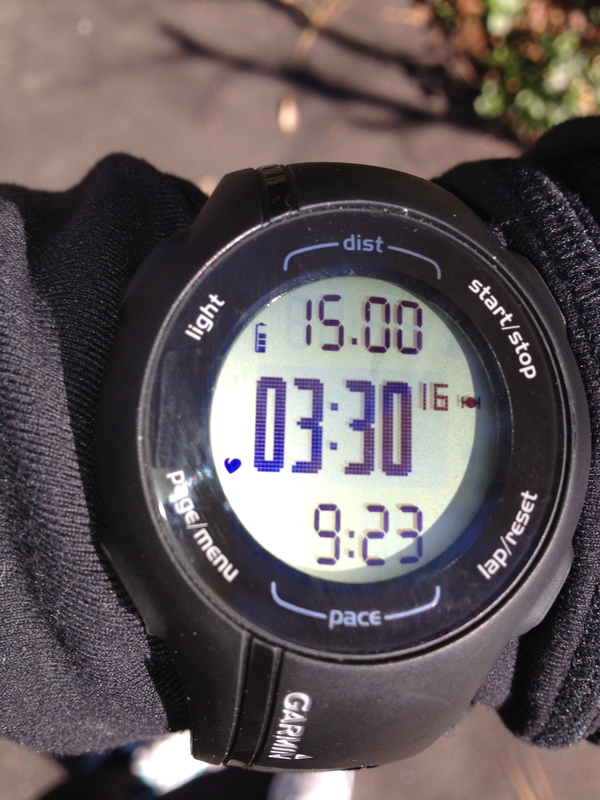 The Turn Around Long Sleeve showed every lump and bump and the pace setter skirt was way too short. Since I was there, I tried on a couple other pieces that I loved! The Yoga to City Jacket (I tried black) is amazing with a ruffle placed at just the right point to hide what my sister lovingly refers to as the, “relaxed muscle.” The Essential and Run for it Jackets, also in black, made my must-have list. I told Brian I wanted an iPhone for Christmas, but maybe a gift card to Lulu would be better. Decisions, decisions! Turn Around Long Sleeve. Sadly, this is not a view of me from behind! 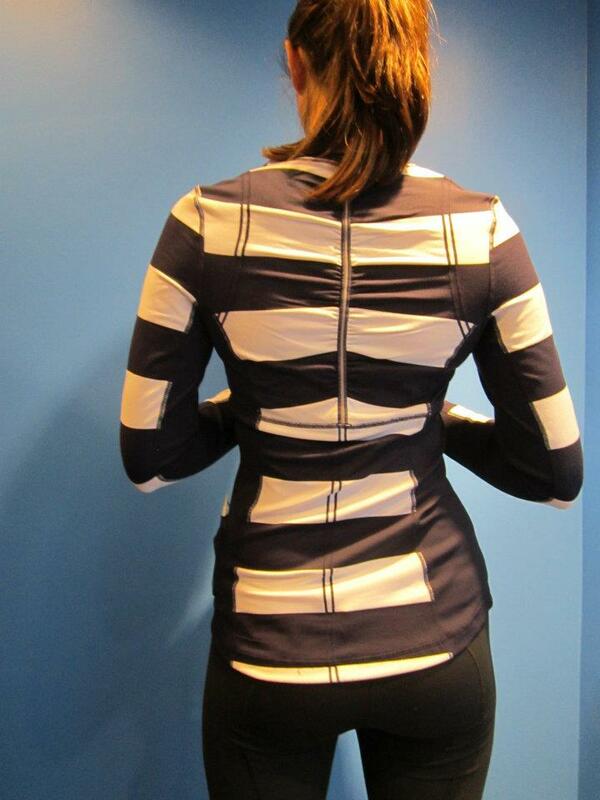 City to Yoga Jacket. This purple actually looks like a deep navy. really pretty. If it had been there in my size I probably would have gotten it. 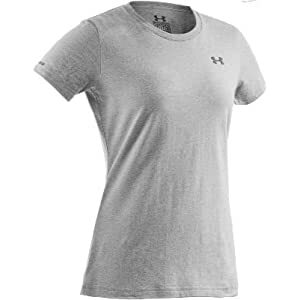 I am always in the market for good running tops, so last week I tried Under Armour’s “Charged Cotton” tees. Under Armour’s fit is funny and I can’t rely on being the same size in every garment. The charged cotton fabric feels heavy and soft (the hang tag says it dries five times faster), and the medium was better than the large. I usually prefer a V or U-neck, because I think they are more flattering on me, but in this case the round neck was better. I didn’t end up buying it, but I might if it gets marked down. 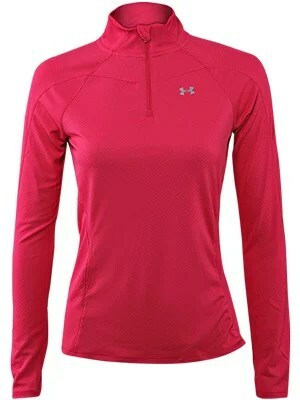 I also tried the Under Armour Escape Lightweight 1/4 zip in white. In this, I liked the large, since it’s meant to be a layering piece. As the title describes, it is lightweight. I’m just not in the market for thin gear right now. It’s still pretty warm in Raleigh, but I know I’m going to be one cold potato in about a month. 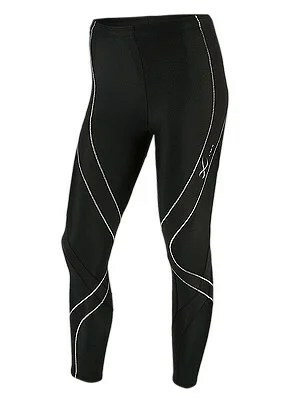 I’m still on the fence about whether or not to try the CW-X Pro Compression pants. I have done lots of research about wearing this kind of gear for extra long runs (and also for recovery) and the consensus is that they work. I think I’m going to wait a little longer, until my mileage gets up to 14/15 to see if what I have is performing well enough. Aside from running gear, I probably should mention some of the Mommyland clothes that have made an appearance lately, since I can’t live in running gear all the time (though sometimes I wish could). I discovered a designer named Lesley Evers, out of Berkeley, California. Her day dresses and tunic are beyond cute. They are functional, well made, and thoughtfully designed. I called their design office to place an order and was met with the best customer service I’ve ever received (hand to God). Melissa, who I believe is Lesley’s right hand person, walked through the work room trying to find the right size dress for me. She even sent me a stack of extra pieces in different size to try for fit. Who does that? I ended up keeping two tunics that will get lots of wear in the Spring, and a dress that I wore to the girl’s birthday party. The Hope Dress. They were out of the green, so I wore the Platinum Tumbleweed pattern to S&G's birthday party. The Ellie in Pink Parasol. I can't wait for Spring to wear this one. Another designer,Kayce Hughes, had a trunk show a few months back at a shop I love in North Hills; The Paper Buzz. Kayce used to work for Ralph Lauren and makes really classic, lovely pieces for women and children. I wore her Western denim shirt dress to meet my grandparents at Thanksgiving. I was planning on wearing my Frye (tall) boots, but since everyone took their shoes off at Aunt Nor’s front door, I decided against it. I probably could have gone bare-legged, but I knew I’d be on the floor with the kids, etc. In the end, I paired it with my Banana Republic skinny jeans in black, which worked out fine. The dress was super comfortable, I felt great (appropriately attired), and am looking forward to wearing it again; next time with flats and the sleeves rolled (when the season permits). This is the Nashville dress. The Western is more straight, not as full in the skirt. Her little girl collection is TDF! Finally, my Garmin arrived! I chose the 210 over the 405, mostly because I’m old school and prefer buttons over a touch bezel. It’s charged and ready to run, but today is a rest day, so until tomorrow…. Tell me about your recent finds and gear goodies! You are currently browsing entries tagged with running gear at Running in Mommyland.